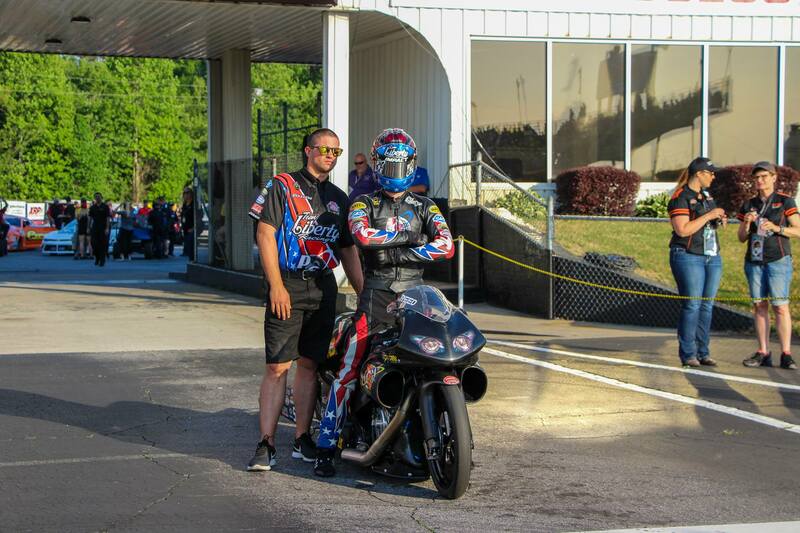 Angelle Sampey powered her Team Liberty Racing Buell to her first semifinal appearance of the 2018 season at the 38th annual NHRA Southern Nationals at Atlanta Dragway. Teammate Cory Reed qualified in the top half but fell in the first round of eliminations in a close matchup against Scotty Pollacheck. In the first round, Sampey was qualified No. 11 after four rounds of qualifying at the Commerce, Ga.-based track and had a first round matchup against Matt Smith. As both competitors staged their Pro Stock Motorcycles, Matt Smith left early with a -.030-second red light and Sampey’s troubled 7.176, 179.83 advanced over Smith’s 6.906, 193.18. Second round, Sampey took on Andrew Hines. With eight Pro Stock Motorcycle World Championships between them, Sampey captured .030-seconds advantage on the starting line over Hines and drove it all the way to the win with 6.939, 193.18 over Hines’ 6.916, 193.16. In the semifinals, Sampey clocked in with a 6.978, 191.40 but it wasn’t enough to edge out Scotty Pollacheck’s .009-second reaction time and a 6.960, 191.16.